Use Firefox at home, but forced to use Internet Explorer at work? Use OpenOffice or AbiWord at home, but forced to use MS Office at work? Those IT people have to wake up! You're gonna love this news. 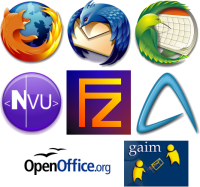 "Portable Apps Suite is a collection of portable apps including Firefox, Thunderbird, NVU, OpenOffice, AbiWord, Sunbird, Gaim and Filezilla, all preconfigured to work portably and be easy to back up. Just drop it on your USB portable device and you're ready to go." That's right - no computer administrators to deny you access to your favourite non-microsoft programs anymore! I'm so over the moon about this! Just download the .zip file of what you want, and extract the files to a folder on your USB drive. Everything else is done for you. No installers, nothing. All FREE, and available on any Operating System! If you don't own a USB, NOW is the time to buy one. You'll get a really good USB drive for under NZ$200 and it will likely have a longer shelf life than your current computer. nb: I hear there is also a version out there for CD-RWs if USB drives ain't yo thang. Soon there will be Audio & Video Editors, Games and Game Emulators, Image Editors & Viewers, password managers and the biggie - Antivirus. ps - Microsoft's Vista will either be very impressive or simply miss the boat. Methinks that net is simply too fast for them to keep up.